IAS exam preparation requires a number of factors to be taken care of. 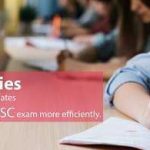 As the UPSC syllabus is extremely vast, the IAS aspirants are required to go through all the details, leaving out nothing. The competition to get selected for IAS is extremely tough. Besides, it is getting harder day by day. Why make the notes for IAS exam preparation? Notes make it easier for a candidate, irrespective of the exam he is going to face, to revise all he has studied within one go. It is simply not possible to revise all you have studied just a day or perhaps, a few hours before the examination. And the IAS exam preparation forms no exception. Thus, making notes is highly essential for IAS exam preparation so that all the important details, topics, subjects etc., are easily and quickly revised by the IAS aspirant whenever he requires doing so, specifically, a day or even few hours before the examination. How to make notes for IAS exam preparation? Well, it’s understood that all of us have been making notes to clear various exams all through our student life and also, as and when required. But most would agree that when you aim at cracking none other than the UPSC exam and visualize yourself as a potential administrator, the IAS exam preparation, of course, does require quite a few specific tips. Make it sure that the notes you are making are effective: The notes you make should actually serve the purpose they are meant for. Thus, whenever you read your notes, you should be able to revise all the important details, facts, topics, subjects etc., and whatsoever is actually required to be revised. It should never be forgotten that your notes are an important means of boosting your memory so that nothing important is skipped out of your mind when you are actually answering the UPSC question paper. Thus, no IAS aspirant should ignore the importance of notes for the IAS exam preparation. Be selective, but do not overdo so: It should always be kept in mind that the notes are supposed to save your time when you make the revision. So, in case, you spend making a lot of time on making notes, including even those details that do not hold much of relevance as far as IAS exam preparation goes, the entire purpose of making the notes fails there itself. So, you should be selective, i.e., you should single out the details, facts and topics etc., that are really worth preparing the notes on. However, do not be over selective. Otherwise, the risk factor of omitting to revise the important details just a day or a few hours before the IAS exam just cannot be ruled out. So, think of it carefully, what you are going to make the notes on. 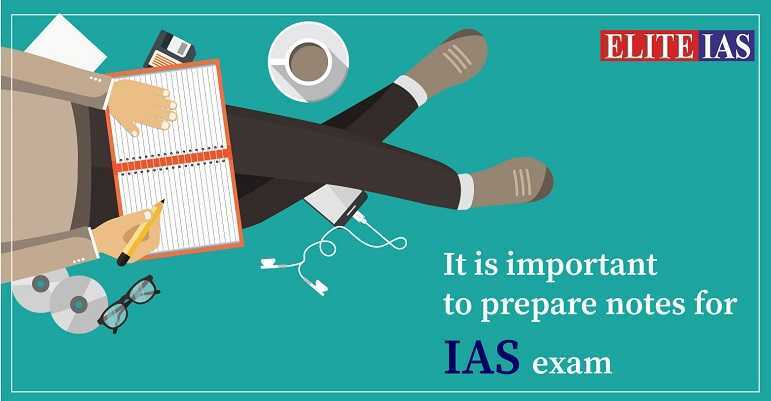 That is, you should prepare notes on all the important details, topics, and subjects – leaving out all that which is not of significance as far as the IAS exam preparation is concerned. Treat the notes as unique for both the Prelims as well as the Mains: It is advisable to make different notes for both the Prelims as well as the Mains. Using the same notes for both the Prelims as well as the Mains would be a horribly bad idea. Thus, as already said earlier, do not be over selective. If you aim at saving the time by using the same notes for both the Prelims and the Mains, you are bound to discover, to your own dismay, that the notes prepared for the Prelims do not hold good for the Mains. It is so because the syllabus for the Mains requires you to study in greater details. And if you discover the bitter truth while answering the Mains question paper in the UPSC, it will only reinforce that perhaps your skills for making the notes were not at par with those of the fellow aspirants. And remember, you not only have to crack both the exams – the Prelims as well as the Mains, but also score well and rank high in the merit list so that UPSC allows you to join the Indian Administrative Services. Update the notes as and when required: Once you have prepared the notes on a topic, it is up to you to revise them as frequently as required depending upon your own daily schedule. However, some of the topics including current affairs require the notes to be updated. So, it is advisable to keep your notes updated so that no important details or facts are left when you make revisions for the IAS exam preparation. As a result, you are likely to feel more confident and feel better equipped to answer the UPSC question paper and score well. It, of course, will help you rank higher as well when UPSC announces the results. Keeping the notes updated is highly important and it does help you keep ahead of your fellow competitors. Keep the notes precisely to the point: While preparing notes for any exam, but specifically for the IAS exam preparation (for various reasons including the vastness of the UPSC syllabus, lack of time to prepare etc. ), it is advisable to keep the notes precisely to the point. Otherwise, the purpose of making notes simply fails. You could have simply Xeroxed the entire book. But that does not serve any purpose either. You are not likely to have sufficiently lot of time to read and/or revise the big, bulky books chapter after chapter a day or a few hours before the exam. So, in order to make the revision feasible and also to keep a strong hold over all the facts and details of all the topics and subjects that are encompassed by the vast syllabus that is prescribed by UPSC, it is best to keep the notes precisely to the point. Structure your notes specifically: In case, you are making the notes on a register, it makes sense to make a Table of Contents on the beginning pages of the register. Besides, putting the concerned topic on the top of the page when you begin notes for a new topic and numbering all the pages of the register would help you maintain the Table of Contents with ease. But why should you be taking so much of pains to structure the notes? It is so because, with well structured notes, you would be able to revise the topic that you require to revise with greater ease. Besides, the time you might have spent otherwise in locating the required notes in order to revise them from the pages of the register would also be saved! And that’s what you have been preparing the notes for! Well, you aim at saving the time whenever you require making revisions. Besides, more specifically so, when it is the day before the exam, or even more specifically so, when there are only a few hours left before the exam. Thus keeping your notes structured does make the revision quicker and easier for you when it comes to the IAS exam preparation. Include the graphics as and when required: It is good to include the graphics also as and when required in the notes that you have been making for the IAS exam preparation. While you revise your notes for the IAS exam preparation with the help of the graphics, you are more likely to remember the graphs, pi-charts and bar charts etc., and make use of this knowledge while answering the question papers for the UPSC Prelims and the Mains exam. Be thoroughly sure of all the facts: Besides, what counts the most is that the notes you make for the IAS exam preparation should be prepared only after making a thorough study of the topic concerned. In case, there is any confusion concerning the facts and/or the details of any topic that you are making the notes on for the IAS exam preparation, first be sure that the details and the facts etc., that you are including in the notes are absolutely correct. Otherwise, you are very likely to keep revising the incorrect details and write the same eventually (if so required by the questions) while answering the UPSC question papers. Finally, the notes prepared by you should be simple. There is no point in making them complicated in any way at all. What all UPSC tests for is your knowledge of the subject, and also how well you will be able to use it as an administrator. Well, if you aim at cracking the UPSC exam and join the Indian Administrative Services, the notes that you prepare should also be not only comprising the absolutely correct details, but should be prepared with an analytical bent of mind. Apart from the knowledge that a candidate has, his being absolutely aware and alert to the situation counts as well. Besides, while preparing the notes, take care that you prepare the notes not only using absolutely correct facts and details and with an analytically aware mind, but also staying unbiased and unprejudiced. Taking care of all the above qualities while making notes for the IAS exam preparation, it is very likely that all these qualities will be reflected in your answers as well while you face the UPSC examination. Thus preparing the notes in the right manner is highly important for the IAS exam preparation. Which is the best Optional Subject for IAS Preparation? How to prepare notes for IAS exam preparation? What is the best strategy to prepare for IAS Mains Exam? Would you like to prepare for IAS while still in college?